I vividly remember my first encounter with bichhu ghas, literally scorpion grass. My botany teacher had introduced me to the Himalayan giant nettle, known as Girardinia diversifolia in botanical lexicon, during a study trip to a forest near Narkanda in Himachal Pradesh. Five years later, I came across the plant again during a trip to Niti Valley, located along the Indo-China border in Uttarakhand. The experience this time was not pleasant. I was walking through the forest when I felt a stinging pain on my left ankle, as if stung by a scorpion. 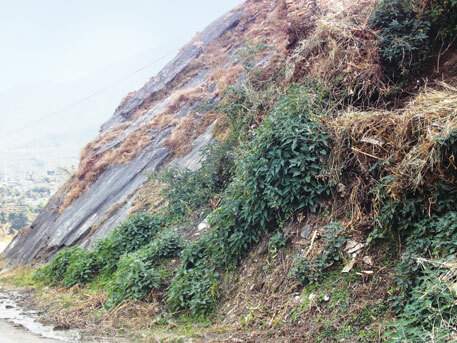 My colleague told me that I might have brushed against dhol kanali, as the plant is known in the Garhwal region. The oil glands of its stinging hair contain formic acid, which, when in contact with skin, cause iritation. Though my pain subsided within a few hours, some might need anti-allergy medicine. The nettle, found abundantly in forests, riversides, roadsides, on farm bunds and in degraded patches, is however a favourite among people in the hilly areas of Uttarakhand, Himachal Pradesh and Jammu and Kashmir, and even in neighbouring Nepal and Bhutan. Between March and May, people carefully pluck the tender new leaves using an iron tong. The leaves are first exposed to fire to remove insects and then washed and boiled before cooking. People in the Kedarnath Valley prepare a delicious dish from its leaves and inflorescence, that tastes like mustard greens. In some areas, people roast its seeds and make pickle with it. “Bichhu ghas is rich in iron. It is good for pregnant women in rural areas who do not have regular access to iron pills,” Biru Lal of Maikhanda village in Upper Kedar Valley had told me. Modern science underscores his wisdom. According to The Wealth of India, an encyclopaedia of India’s natural resources, leaves of the nettle are also rich in Vitamin A. “Its chemicals, formic acid and histamine, act as anti-inflammatory agents,” says N S Bisht of H N B Garhwal University in Uttarakhand. Bisht, who has studied bichhu ghas, says consuming decoction of the roots and basal stem cures malignant boils, gastric problems and constipation, while decoction of its leaves helps cure fever. Paste prepared from its roots is applied externally for treating wounds, headache and swollen joints. Ash of its leaves is applied externally to treat ringworms and eczema, he adds. Jean Bardot, scientist at University of Maryland Medical Centre in the US, terms the plant as “a super wild food” for its diuretic, anti- rheumatic, anti-allergic nature. All one has to do is collect its leaves and roots carefully, without getting stung. Boil tender leaves in water till they are pulpy. Grind the pulp. Heat oil in a thick bottom pan. Add asafoetida and jakhiya to it. Let the spices crackle. Add the pulp and fry it. Add salt. Garnish with fried red chilly. 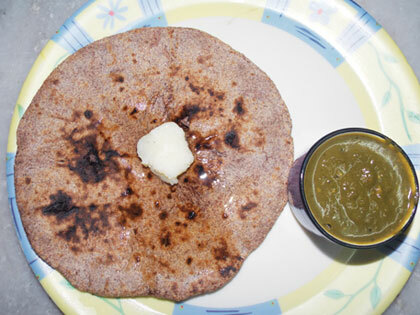 Best savoured with mandua (finger millet) chapati with dollops of fresh ghee. Boil tender leaves in water till they are pulpy. Rinse the pulp, drain the water and grind it with rice paste and gram flour. Heat oil in a thick bottom pan, add asafoetida and jakhiya. Let them crackle. Add the paste and salt. Stir to mix it well. Check the consistency of the gravy. Add water if required. Cook for 10 minutes. Garnish the kafuli (green curry) with fried red chilly, a tablespoon of fresh curd and fresh ghee. Eat it hot with rice, fresh curd and ghee.